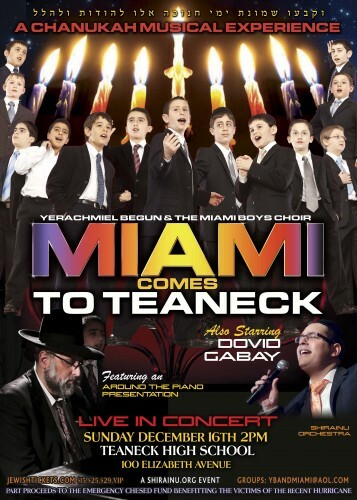 Added Chanukah Show – MIAMI COMES TO TEANECK! A CHANUKAH MUSICAL EXPERIENCE FROM COAST TO COAST! This Chanukah MIAMI USA will perform east & west!! Sunday the first day of Chanukah, December 9 at 2pm on the west coast in Los Angeles at the Wilshire Ebell Theatre. Thursday December 13th, at 730pm the 6th night of Chanukah, on the east coast, in Crown Heights at the Brooklyn School of Music. Sunday the last day of Chanukah Dec. 16th 2pm, at the Beautiful Concert Auditorium of Teaneck High School. Tickets are family priced for a special Chanukah treat. Be a part of this Amazing Chanukah experience!